YUCAIPA, CA--(Marketwired - Feb 11, 2016) - William Lyon Homes' Cedar Glen in the prestigious community of Chapman Heights now has an array of beautifully upgraded Residence Three homes available for immediate move-ins. Homebuyers who act now can take advantage of a 45-day escrow and quickly settle into the must-see neighborhood's most spacious single-family floorplan. The popular design features four bedrooms, including a sought-after first-floor bedroom; a master bedroom with dual walk-in closets; three baths; a versatile second-floor bonus room; a contemporary island kitchen and charming dining nook; a two-car garage and private rear yard. Valuable appointments enhancing Cedar Glen's upgraded homes include a washer, dryer and refrigerator, granite kitchen countertops, stainless steel appliances and upgraded custom flooring. Those interested in these rare quick move-in opportunities in a coveted setting adjacent to the Yucaipa Valley Golf Club are urged to visit the sales gallery today. For details on Residence Three or William Lyon Homes' valuable extended 3-year Warranty & Service Program, log on to www.LyonCedarGlen.com. "Our current Residence Three homes are brimming with innovative design elements and valuable upgrades that make them virtually irresistible, especially to family homebuyers," said Ben Blomdahl, Director of Sales for William Lyon Homes. "Contact our sales team today and you could be moved into your new Cedar Glen home this spring." Cedar Glen in Chapman Heights furthers William Lyon Homes' reputation for building the best homes in the most desirable locations with three comfortably sized single-family home designs. Spanning 1,902 to 2,150 square feet, interiors showcase three to four bedrooms, two and one-half to three baths, a loft or bonus room and convenient two-car garages. Select locations feature distant views of the picturesque San Bernardino National Forest. The prime Yucaipa location is an asset to commuters with its close proximity to I-215, I-10 and the 91 Freeway. Those seeking premier recreation will appreciate the setting next to the Yucaipa Valley Golf Club, providing outstanding opportunities for fun and leisure with access to the public 18-hole Championship-length, par 72-course designed by the renowned golf course architectural firm of Rainville & Bye. The 6,803-yard course offers challenging play with the stunning scenery of the San Bernardino Mountains serving as the backdrop. Popular retail and dining destinations are also nearby at the Yucaipa Valley Center, which features a Vons, Staples, TJ Maxx, Ross Dress for Less, Subway and more. Residents with school-aged children will appreciate the area's well-rated local schools within walking distance of Cedar Glen, including Yucaipa High School, Park View Middle School and the Chapman Heights Elementary School. To visit Cedar Glen at Chapman Heights, travel the I-10, exit Live Oak Canyon Road and proceed north. Live Oak Canyon Road turns into Oak Glen Road after crossing Yucaipa Blvd. Turn left on Chapman Heights Road, right on Blue Grass Road and follow the signs. 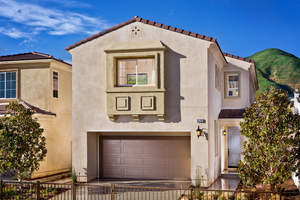 The sales gallery is open daily from 10 a.m. to 5 p.m. For more information, please call 909.797.2210 or visit www.LyonCedarGlen.com. Immediate move-ins available on select Residence Three homes at Cedar Glen.